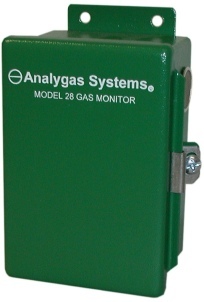 Analygas® Systems Model 28 Gas Monitor is particularly sensitive to Ammonia and has an exceptional solid state sensor that is largely unaffected by fluctuations in temperature, relative humidity and common contaminating gases. Popular for use in cold storage facilities, this inexpensive watchdog protects products 24/7, even in the most extreme conditions. Analygas® Systems Model 28 is a wall mounted gas monitor for use in non-hazardous indoor locations. It is housed in a rugged steel enclosure. This product was introduced because of the demand for a monitor having an Ammonia specific solid state sensor that will communicate with a system controller. It is suitable for use where propane or battery powered equipment may be present. As an Ammonia Monitor, it has a wide operating temperature range of -40ºC to 40ºC (-40ºF to 104ºF), without the need for an internal heater. Designed by Analygas Systems, the Model 28's unique built-in tunnel causes sample air to flow onto the sensor by convection. In this manner, the sensor is not mounted externally and is protected from direct drafts, dust and debris. A 4-20mA output is standard for data logging, PLC or computer processing, etc. While popular for use with facility process controllers, this instrument may also be connected to Analygas Systems Models 20, 20B, 40 and 41, multipoint systems. It can also be configured to detect other gases.